An F-150 EcoBoost™ race truck, with an engine that has the equivalent of 10 years of rugged use, finished the grueling Baja 1000 in just over 38 hours, traveling 1,061 miles. This same stock EcoBoost engine has endured the equivalent of 150,000 harsh user miles on the dynamometer, was installed into a new 2011 Ford F-150 to work as a log skidder in Oregon, towed a 11,300-pound trailer at a high-speed NASCAR track and beat the competition in a steep-grade towing contest at Davis Dam. 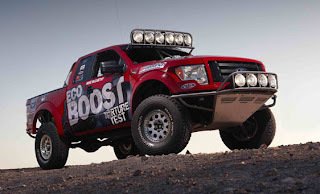 The Baja 1000 represented the culmination of the F-150 EcoBoost torture test program, demonstrating the durability and capability of the class-leading 3.5-liter EcoBoost truck engine. The 3.5-liter EcoBoost engine used to power the race truck performed spectacularly in the harsh terrain and extreme temperature swings of the Baja California Peninsula. The truck endured hard accelerations – often at full throttle – and stiff decelerations across the mountains at temperatures that swung between freezing and 100 degrees Fahrenheit. Though the EcoBoost engine entered the race with the equivalent of 10 years worth of rugged use, its inherent performance advantages – twin turbochargers and direct fuel injection – helped it complete the race. The engine that powered the race truck goes next to the Ford powertrain laboratory for a teardown and inspection. The EcoBoost truck engine produces a best-in-class 420 lb.-ft. of torque at 2,500 rpm and 365 horsepower at 5,000 rpm. Up to 90 percent of its peak torque is available from 1,700 rpm to 5,000 rpm, which helps drivers stay in the power.